The David Barmes Memorial game between the Swiss National Team and the winners of the SCA League in the previous season (Bern C.C.) took place on 15th May 2011. The fixture was initiated in the last century by the late Dr. David Barmes in his capacity as SCA Chairman / President, but had fallen into disuse in recent years. The SCA International Match Manager Peter Mac Laverty in his address to the teams prior to the game, announced the decision to revive the fixture, and paid tribute to his old friend David Barmes: the first president of the SCA, who would be turning in his grave at the current situation in Swiss cricket, and the man who as president of Geneva C.C. 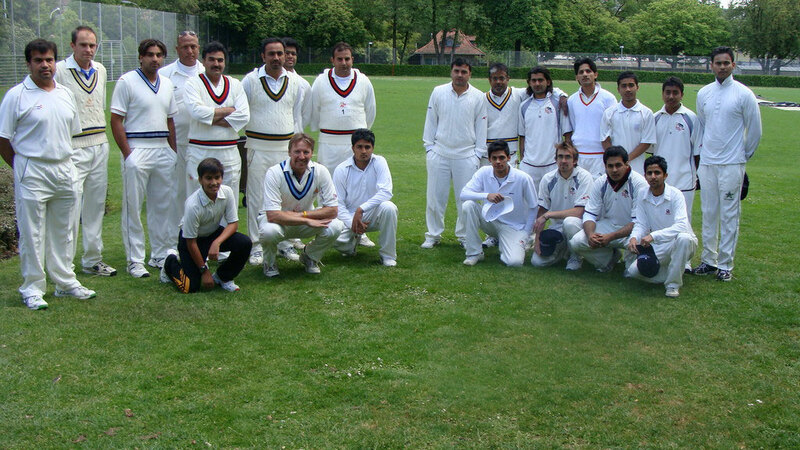 had promoted the foundation of Bern C.C. through donation of Geneva’s cricket matting to the fledgling club in 1977. Sajid Safiat, the captain of the Swiss Team, won the toss and elected to bat. This was a decision he would come to regret, as the Bern wicket soon proved to be somewhere between malicious and unplayable. Bern of course knew exactly how to exploit the conditions and blew away the opposition in the 31st over for 94. Attacking batting from Sajid and Shakanawaz at one stage threatened to turn the game their way, but it was not to be; tight bowling, the treacherous Bern wicket, and excellent fielding kept the pressure on, and in the end the Swiss Team fell just short of that 98 landmark total set by the Aussies at Melbourne. Best bowling performances for the Bernese were Farhan (4 overs, 4 for 18) and Adam Murfitt (5 overs, 2 for 18). Batting second, chasing a small total looks very easy if you get a good start, rather less so if you lose early wickets. Both Bern openers were dropped (on the boundary) in the opening overs, so the result might have been very different. However, Bern continued to attack, in particular their skipper Tissa De Zoysa (40), and before long (in 16.3 overs) it was all over; Bern had won by 8 wickets. For the match scorecard, please follow the link to Berne CC's website.